Barely a day or two after writing about Whitley Bay Woolworths still being empty, I now read that it’s going to become a B&M Bargains store – and will open on Thursday. Relatively little-known before 2009, Blackpool-based B&M Bargains is definitely one of the biggest beneficiaries of Woolworths’ demise, picking up more than 40 old Woolies shops to date, and seemingly having a knack for getting its new stores up and running in a matter of days. 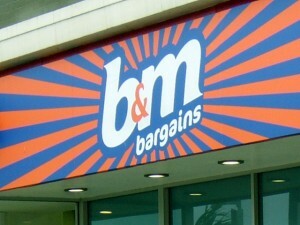 As I’ve mentioned before, I do struggle a little to see B&M as a destination store. Perhaps I just find it difficult to see beyond the ghastly blue and orange fascia? Clearly, however, having a reopened shop is vastly preferable to a vacant unit, particularly when it brings 40 new retail jobs to Whitley Bay. Perhaps even more importantly, it’s a vote of confidence in Whitley Bay town centre – and one that may hopefully encourage other retailers to follow. Previous story Woolworths to make a high street return? Nice to hear that WB shop fronts are being filled but I can’t imagine the residents of WB are much consoled by the loss of M&S with a B&M!